Toshimaru Nakamura is a pioneer on his instrument no-input mixing board. Releasing nearly hundred albums since the mid 90’s, including 9 solo albums. However, in this project with Martin Taxt appears with a new approach to his instrument. Taxt has connected his tuba to Nakamura’s mixer through a microphone, and thus interrupts his analog signal. This creates a raw, brutal and surprising character to the music. Since releasing the album “Pan on Fire” on Monotype Records in October 2015, they’ve played shows in Germany, Switzerland, Norway and Japan. Touring behind their second record as a duo “Listening to the Footsteps of Living Ones Who Are Still on the Ground” Nakamura processes Taxt’s deep tuba tones. He mutates wavering grumbles and bass driven hum into clipping static and gurgling chunks of noise. Their sound together is cohesive and organic. It crackles and screeches like electricity weaving its way through sheets of metal. Nakamura whips Taxt’s tuba tones into a tropical storm of stereo chaos. Truly the dynamic duo. Not to be missed! The use of the mixing board in this manner is not only innovative in the sounds it can create, but, more importantly, in the approach this method of working with the mixer demands. The unpredictability of the instrument requires an attitude of obedience and resignation to the system and the sounds it produces, bringing a high level of indeterminacy and surprise to the music. Nakamura pioneered this approach to the use of the mixing board in the mid-1990’s and has since then appeared on over one hundred audio publications, including nine solo CD’s. Martin Taxt, born in Trondheim, Norway in 1981, finished his studies at the Academy of Music in Oslo and CNSMDP in Paris in 2006. Since then he has established himself in the international experimental music scene. He is releasing albums and touring with groups such as Koboku Senjû and Microtub. Since 2013 he has been a part of the award winning art collective Verdensteatret. He has been running the experimental music label SOFA since 2010 with the musicians Kim Myhr, Ingar Zach and Ivar Grydeland. 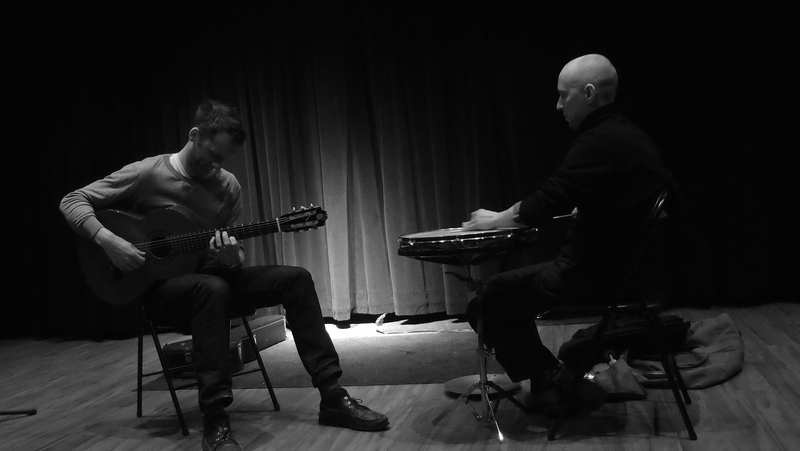 Purveyors of quiet, minimalist music, at turns introspective, bold, fascinating and intense, this duo generates a highly moving improvised set that is meditative and fresh. Holger Schoorl is a composer, improviser and guitarist based in Toronto. His primary collaborators are Tomasz Krakowiak (improvising duo), Germaine Liu and Mark Zurawinski (improvised and composed music), Scott Thomson, Kyle Brenders and Pete Johnston (as band “Ancient Egypt” now on hiatus), the guitarists Ken Aldcroft, Rob MacDonald and Mike Savona (improvised and composed music) and more recently with Phil McKee (video and performance collaborations) and Jill Connell (music for theatre). Percussionist Tomasz Krakowiak‘s sound ranges from post-minimal explorations of barely audible phenomena to drone, overtone density. His music is characterized by intense and detailed sonic events. Apart from playing duets with Holger Schoorl, Branko Dzinovic, Michelangelo Iaffaldano, Krakowiak has performed and recorded with John Butcher, Kaffe Matthews, Gert Jan -Prins, CCMC and others.